After the gluttonous pleasures of the holiday season we’re back to the gym and eating a lean and clean diet. We’re big fans of Dr. Oz, so we’ve been following his 21-Day Weight Loss Breakthrough Diet, a predominantly plant-based diet (with two days of chicken and fish) to kickstart weight loss and promote overall good health. After a long day at the office and a hard workout at the gym, we crave something hearty and satisfying. 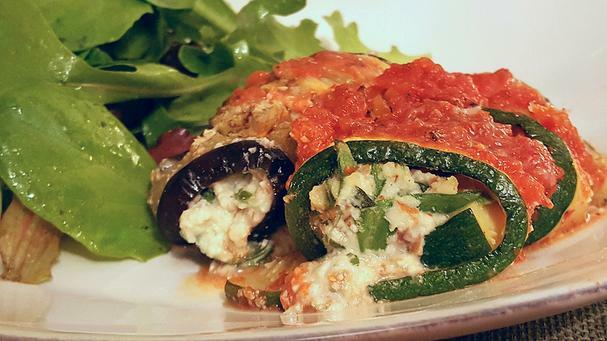 These grilled eggplant and zucchini roll-ups are filled with a protein-rich “ricotta cheese” made from blended almonds and is seasoned with freshly chopped basil and spinach, garlic, oregano, sea salt and freshly cracked black pepper. For the tomato sauce we simply used a can of organic fire roasted tomatoes. Easy peasy! This dish is so easy to make, takes just minutes, and is super delicious! Best of all, you feel satiated - not like you’re on a diet. First, soak the almonds overnight in enough water to cover by at least 1/2 an inch. When you’re ready to blend, drain the almonds and transfer to a blender. Add enough of water (or almond milk) to blend into a thick, ricotta-like consistency. Scoop out half of the almond ricotta mixture into a bowl. Store the remaining almond ricotta mixture in the refrigerator or freezer for future use. Place a large stovetop grill or skillet over medium-heat. 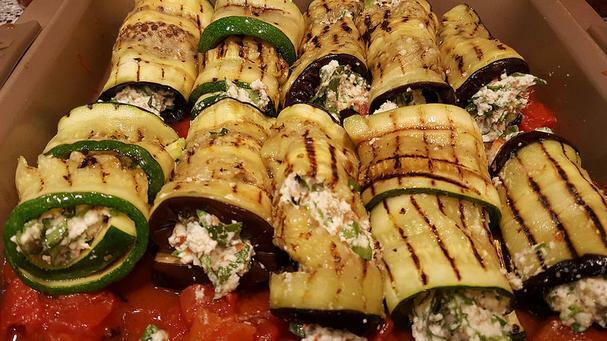 Lightly spray each side of the eggplant, season with salt, and place on the grill. Grill until lightly charred, about 1 minute each side. Set aside on a plate. 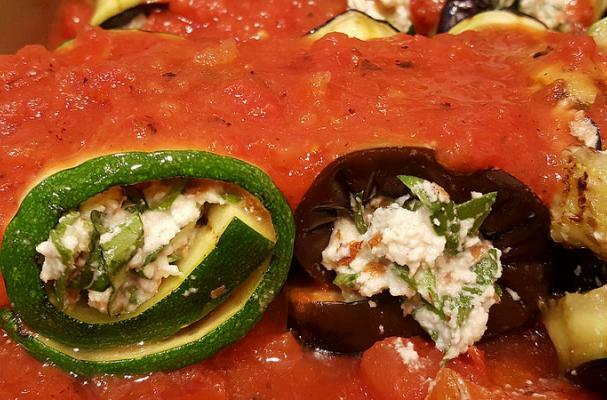 Continue until all the eggplant and zucchini are cooked. While the eggplant and zucchini are cooking, prepare the herb almond ricotta. 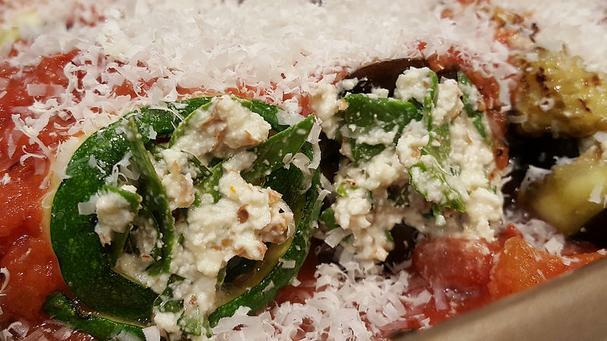 Add the minced garlic, chopped spinach and basil, and a pinch of dried oregano to the almond ricotta cheese. Season with salt and pepper and mix well. 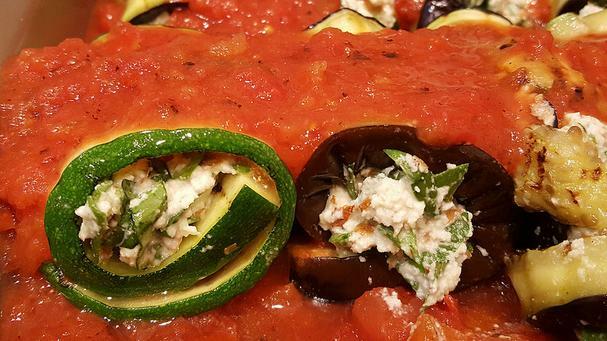 Pour half of the can of tomatoes into an 11 x 7 baking dish or one large enough to accommodate 10-12 roll-ups. Blend the remaining tomatoes into a puree (optional) or leave them chunky; set aside. To assemble: place 2 tablespoons of the almond ricotta mixture on the smaller end of each piece of eggplant. Roll up and place in the baking dish. Repeat until all the eggplant is used. Slightly overlap 2 zucchini and place 2 tablespoons of the almond ricotta mixture at one end. Roll and place in the baking dish. Repeat until all the zucchini is used. 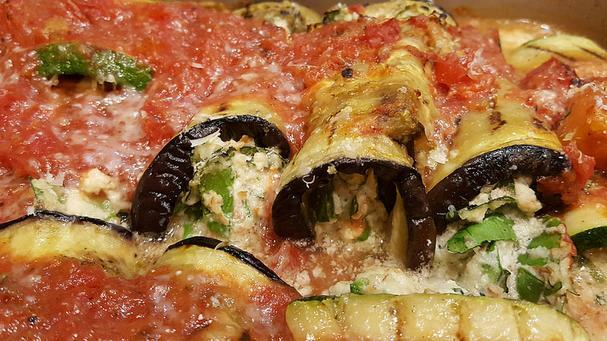 Top the zucchini and eggplant roll-ups with the remaining tomatoes and top with grated Parmigiano-Reggiano cheese. Note: if you want this dish vegan, use your favorite vegan cheese or skip the cheese altogether. Bake in the pre-heated oven for about 15-20 minutes.